Lorries are parking on the coastbound M20 in Kent to ease a traffic backlog at the Port of Dover after industrial action by SeaFrance workers in France. Kent Police said phase two of Operation Stack was now in force. The coastbound M20 is closed between junctions eight and nine for Leeds Castle and Ashford West, and between 11 and 12 for Hythe and Cheriton. Motorists have been advised to avoid the area. Non-freight traffic is being diverted to the A20 at junction eight. Officers added that only SeaFrance services are affected by the industrial action, but that ferry passengers should still check with their operator before travelling. Police said phase two was brought in to help cope with the amount of freight travelling to both the Channel Tunnel and the Port of Dover. A spokesman said that implementing both phases of Operation Stack allowed up to 4,750 vehicles to wait in holding areas on the motorway and at the tunnel and port. He said the Port of Dover was "operating to capacity to clear the backlog", with some ferries delayed because operators were working to ensure they were fully loaded with lorries before sailing. Eurotunnel was running to schedule and had five departures an hour with extra capacity and each service able to take 150 freight trucks, he added. The Highways Agency had suspended resurfacing work on the A20 while Operation Stack is in place, he said. "Implementing Operation Stack and transforming sections of the M20 motorway into a lorry park remains an emergency provision for Kent Police," he added. The SeaFrance pay dispute began on Thursday afternoon, when the ferry operator said talks were under way with staff. A statement on the ferry operator's website informed passengers: "SeaFrance regrets to inform you that due to industrial action by onboard officers, crossings are currently suspended." 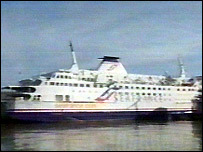 It advised passengers to call SeaFrance for information.